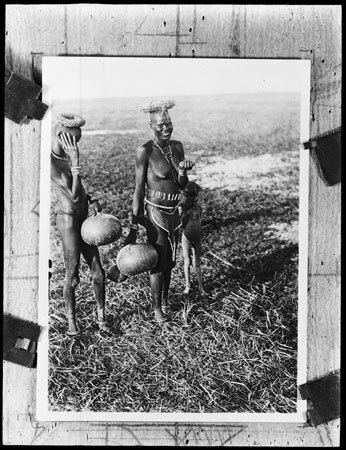 A copy negative of a print, almost certainly by the administrator Frank Corfield, showing a woman, girl and small boy carrying gourds and wearing head-carrying rings, probably collecting water from the nearby river. The woman has cicatrice designs on her abdomen and in wearing a leather apron as well as a cowrie-decorated belt. This copy negative seems to have been made by Evans-Pritchard sometime in the 1940s or '50s, and the measurements around the print were made in order to produce a negative of the correct size for direct contact printing as a lantern slide, which still exists in Evans-Pritchard box of teaching slides. Morton, Chris. "Nuer women collecting water" Southern Sudan Project (in development). 03 Jan. 2006. Pitt Rivers Museum. <http://southernsudan.prm.ox.ac.uk/details/1998.353.62/>.